We’ve all read and heard about the 1% er’s. They’ve got lots of money and live in big houses and drive expensive cars and have their own airplanes and jet set around the world. Well, I’m here to tell you that I’m a 1% er! No, I don’t have much money and I don’t live in a big house and I don’t drive an expensive car (it’s 6 years old) and I have to fly in coach and carry my own bags. Then how can I be a 1% er you ask. Easy. I’m a 1% runner! Look at it this way. There are 325 million people in the US currently. 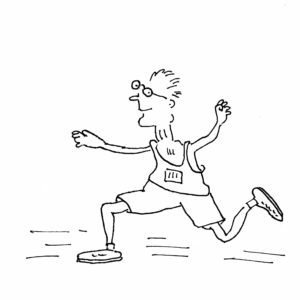 Of that population, there is a population of 65 million who are runners (20%). Of that number, only 9.75 million are over 65 (3%). Since runners are defined by age brackets; 65-69, 70-74, 75-79 etc then it’s easy to see that in my age bracket I am well within the 1% of the population and, as time goes on, my percentage will continue to get smaller so I can be the top 1% of the 1%! Now that’s something! I’ll bet you that none of those 1 percenters with all that money can come close!